IT STARTED as a video test. At Brian Artka'a 5th Ward Milwaukee office on a cold April Friday, we spent a day setting up and shooting video of me talking and sketchnoting. The goal was to test the lighting and the space we wanted to use for the Sketchnote Handbook video, for the Peachpit team. 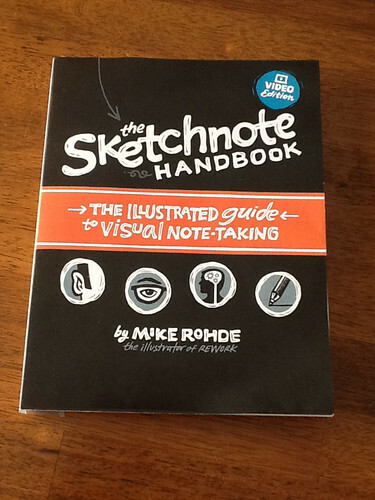 Mike Rohde: The Sketchnoter from size43, LLC on Vimeo. I got emotional watching the video for the first time. I'm amazed at how well Brian captures and tells stories with camera angles, focus, lighting, pacing and music. I'm honored to be one of his subjects and am excited to have him shooting the book video with me. 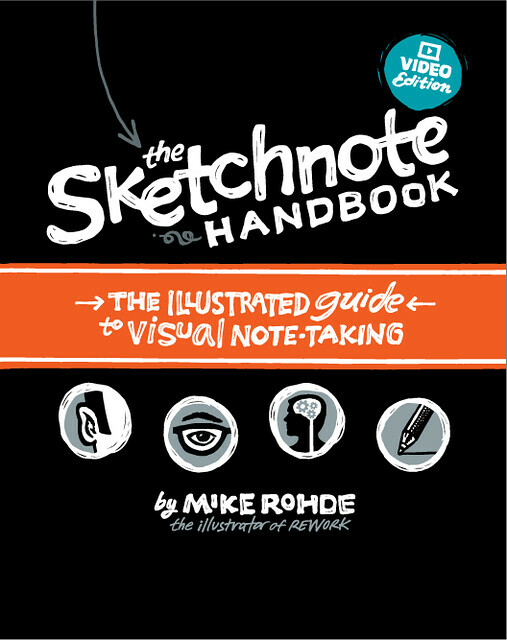 While this video is artistic and focused on me and sketchnoting in a broad sense, the video companion to The Sketchnote Handbook will be much more straightforward, as the goal of the video will be teaching the techniques of sketchnoting. I can't wait to see how the video segments turn out. Oddly enough, even though I'm still writing the book itself, Peachpit needed the cover to be designed and finalized earlier, so they can begin promoting the book and the video with booksellers. Over the years, I've found designing anything for myself challenging — I'm often never satisfied with the work I do on my own projects. The cover design was no different and was a challenge to work through. As I began creating mockups, the cover wasn't working and I couldn't put my finger on why. It felt stiff, and not my style — even though I'd made it. Fortunately, I have created a loose book advisory board of friends who provide good, objective feedback as I'm journeying through this book project. One advisor is Stefan Bucher, designer and creator of The Daily Monster and author of the book 344 Questions. Stefan, being wonderfully blunt, told me to amp it up! Go bold! Make the cover feel like strong sketchnotes I'm known for. I'm very pleased with the end result and now see how important starting over was in the overall process. I must remain flexible as I move forward and face challenges while writing this book. Last week I was honored to appear on The Pen Addict Podcast with Myke Hurley and Brad Dowdy of the 70Decibels Network. I had a great time sharing how sketchnoting came to be, the REWORK, The $100 Startup and Little Book of Talent illustration work resulting from it, the creation of Sketchnote Army and The Sketchnote Handbook. Go have a listen to the MP3 and if you're a pen addict like me, subscribe to the podcast. While it was fun to design my cover, see the Sketchnoter video go live and appear on The Pen Addict podcast, I'm constantly reminded of how much work has yet to be done on the book's writing and illustration. Now it's time to dive in deep — finalize and ink chapter 1 and begin synthesizing research into a narrative for chapter 2: Why Sketchnote. There is much to do in planning the video: outlining, scripting and shooting video. Tough work lies ahead, but I'm excited to get on with it. New to my Sketchnote Handbook articles? Check out the whole series of articles for more backstory and sign up for my email newsletter. Video is just delicious - well done Brian... great talent. Also digging the front cover design - looking forward to seeing the final product and thanks for sharing the process here Mike. Glad to hear you like the cover design, and the documentation. I love, love, love the video! Thanks for sharing your cover design process with us. Greatly appreciated. Can't wait to get my hands on your book. I shared this on my site. Hey, thanks Allen! Really like what you're doing at VisualNotetaking.net! Excited about the book even though it is lots of work - if I didn't love this stuff I wouldn't be doing it, that's for sure. Great video work Mike, ah, I mean Brian. Sort of emotional for sure. I like the book cover too. So Mike, there will be both a book and a video packaged together? Or will they be available separately? Book will be available with and without a video option - or if you just want the video, that will be available as well. Looks like the ebook version will be a PDF produced by Peachpit to deal with the heavy illustrations. Can't wait to read the book! Great work.